Our canine family members add a tremendous amount of joy during the summer playtime months so please give them the love and care they deserve. No matter how many times we hear that warning on the radio that tells us not to leave our dogs in the car during the summer, police are still breaking into them and emergency rooms are filled with dogs that are left for “just a few minutes” while their human families are shopping or banking. They were not “forgotten”. What some people don’t realize is that even when the outside temperature is in the low 80’s, it only takes a few minutes for the temperature inside an automobile to become 102 or more; even with the windows slightly open. Not too long after that, your dog will suffer from heat stroke. If a car is parked in the sun, the temperature inside can rise 30 degrees per minute obviously not taking more than just a few minutes to become a deadly situation. If you are going out for the day and there is a slight chance that your dog will not be allowed to accompany you inside a store or you might need to stop somewhere for lunch, please leave your dog home. It’s the kindest thing you can do. Make sure that wherever your dog is, he is cool and comfortable. 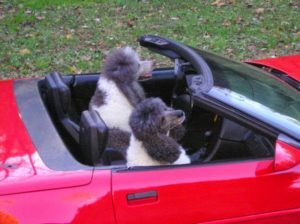 Bracchiciphalic dogs, which are dogs with indented foreheads and short snouts like bull dogs, shih tzus and pugs, puppies, older dogs, dogs with long or thick coats and dogs that are overweight or have health issues especially respiratory and cardiovascular problems should be given extra consideration during the summer months. If you keep your dog outdoors make sure there is plenty of shade and fresh clean water. Chipped ice will help to keep it cooler, longer. If you have areas on your property that collect standing water, DO NOT let your dog drink it; that includes the bird bath and the pool cover. It’s a pool party for intestinal parasites, known as giardia, causing diarrhea and requiring antibiotic therapy. The garden hose is off limits too unless you have a new “SAFE TO DRINK” garden hose. Hoses can be lined with dangerous levels of lead and fittings containing toxic chemicals. So even though we all have fond memories of drinking from the garden hose as kids, it’s really not a good idea. Another summer hazard hiding in plain sight is the sidewalk…especially roadways, black top driveway and brick walkways. I know that sounds pretty much like there’s nothing left to walk on but in bright sunlight some of these areas can be extremely hot and harmful to your dogs paws. If you notice that your dog will not stand still and keeps shifting from leg to leg it’s probably because the walkway is too hot, and you need to cross to an area with more shade. This is something I cannot get use to seeing: dogs riding in the back of pick-up trucks. This is so dangerous that it has become illegal in many states. Your dog may not attempt to jump out of the truck but any short stop might throw him into traffic. Plant food, fertilizer, and insecticides including Tick sprays can be fatal if your pet ingests them. It is equally important that you know what’s growing in your garden as over 700 plants can be harmful. Just a word about swimming pools: if your dog has easy access in, make sure he knows how to exit. Simply teach him the way you would a young child. A life vest is always a good idea.